Coders and CDI specialists sometimes feel the heat to chart in a questionable fashion. From nonpayment for reasonably preventable hospital-acquired conditions (HACs) and higher reimbursements for core measures compliance to publicly available quality comparisons, the pressure is on health care providers to step up their game with regard to care outcomes. The dark side of this push for perfection is the pressure it can place on coders and clinical documentation improvement (CDI) specialists to query less (or more) to support financial or quality objectives. “The challenge to stay informed as a coder and/or a CDI reviewer is growing exponentially because portions of quality measures can be based on coding, such as value-based purchasing, HACs, and mortality outcomes,” says Paul Evans, RHIA, CCS, CCS-P, CCDS, regional clinical documentation manager for Sutter West Bay in California. Though not widespread, some evidence suggests that coders and CDI specialists are being pressured to misrepresent a patient’s medical condition or treatment to increase reimbursement, justify medical necessity, improve publicly reported data, or qualify for insurance coverage. In some cases, it’s subtle pressure to not ask questions. Jon Elion, MD, FACC, founder and CEO of ChartWise Medical Systems and a frequent speaker on ethical documentation practices, cites the example of a physician who wondered whether he should document every case of altered mental state as encephalopathy. Coders and CDI specialists were hesitant to query after a documentation improvement consultant brought in by the hospital encouraged against doing so because documenting a major complication or comorbidity (MCC) of encephalopathy would result in increased revenues. Elion shares two other examples of reimbursement-driven overcoding incidents in which coders and CDI specialists played an unwitting role. One involved a hospital that reported a whopping 38% of its hypertension cases as malignant hypertension, netting approximately $3,000 more per case. Other hospitals in the same state reported a 2.6% incidence of malignant hypertension cases during the same time frame. The second example occurred at a facility that reported 1,030 cases of kwashiorkor in its Medicare patients, resulting in reimbursement of $11,463 per patient. However, some patient charts had no indication of edema or swelling, and no nutritional consult was ordered. Meanwhile, the next highest incidence in the state was 172 patients. Other examples include pressure to stop querying for HACs that are not present on admission or for diagnoses that will adversely affect core measures performance. In other cases, CDI specialists have been asked to stop querying for postoperative complications or not to pursue the diagnosis of acute blood-loss anemia because it may reflect poorly on current or future quality metrics. “It is important for physicians to understand that CDI and coding professionals have a legal duty to abide by industry and governmental conventions and rules,” Evans says. “In my opinion, a vital function of coding is to ensure the clinical picture of each and every encounter is reported accurately, and this is based strictly and explicitly upon provider documentation. We are also compelled to operate in a compliant manner in keeping with the various standards of ethical coding, and these state, among other things, that we will strive to accurately report conditions that are documented. These standards also state that we will follow the published coding guidelines and conventions in order to accurately report [code] the clinical picture of each encounter. In other words, we will not act to misrepresent any encounter. But it’s not just physicians applying the pressure. In perhaps the most highly publicized case of altering documentation to generate higher revenues, the physicians themselves were on the receiving end of the pressure. In 2009, Johns Hopkins Bayview Medical Center in Baltimore agreed to pay $2.75 million after it was discovered that employees were reviewing charts to determine whether there was any way for the hospital to boost reimbursement by increasing the severity of the secondary diagnoses recorded for certain patients. They allegedly focused on lab results that may have indicated the presence of a complicating secondary diagnosis and advised treating physicians to include such a diagnosis in the medical record, even if the condition was not actually diagnosed or treated during the hospital stay. Providers must understand that significant and reportable comorbid conditions, including chronic conditions, should be documented and coded so that outcomes data will be risk adjusted, Evans says. Failure to do so actually can put providers at greater risk of poor outcomes data when they are measured against those with properly reported risk factors. For example, raw, unadjusted data on coronary artery bypass graft outcomes may show that the percentage of patients who died within a specified period of time was 5% at one facility and 3% at another. But this may not be a true reflection of care rendered or a valid comparison of outcomes. One site may have a higher expected rate of mortality because it accepts patients with higher known risks of poor outcomes. Detailed documentation and coding theoretically will refine outcome data to adjust for these higher risks of mortality. However, these risk-adjusted models are only as valid as the codes used to report each encounter. Perhaps the most serious unintended consequence of succumbing to the pressure to misrepresent a patient’s condition or treatment is the impact it can have on safety. When the patient record is not thorough and accurate, it can negatively affect future treatment decisions. For example, if a physician documents chronic kidney disease but does not indicate the stage, the next medical team doesn’t know the full extent of the patient’s kidney function. That could hamper treatment decisions as well as performance measures. Kim Carr, RHIT, CCS, CDIP, CCDS, clinical documentation manager for HRS, a clinical coding and HIM consulting firm, notes that accurate and complete information will reveal that the appropriate quality of care was delivered. It also can aid in identifying ways to improve care through better collaboration across provider organizations. An example is a patient with a Foley-associated urinary tract infection (UTI) that was not hospital acquired and was coded properly on admission. Should that patient return with another Foley-associated UTI, proper initial documentation will allow the physician to see that it’s a recurrent problem and that there may be something taking place at home that should be addressed through caregiver education. New Hanover Regional Medical Center in Wilmington, North Carolina, has established clear guidelines that outline the process for querying to clarify HACs, complications, and any unclear documentation regardless of its impact on quality metrics, according to Linda Rhodes, RN, BSN, CCDS, the hospital’s CDI manager. For example, if a clinical documentation specialist notices documentation that is inconsistent with the clinical picture, the case is referred to the manager/physician advisor. A possible query is posed or a discussion takes place with the provider to clarify the documentation. Evans, who also encourages coders and CDI specialists to contact their internal compliance department if they feel they are being pressured to under- or overcode for the sake of metrics, says one way to build common ground may be to reference generally accepted evidence-based criteria to define, document, and code key conditions. Ideally, there is a physician champion who can help build such query forms and act as a liaison between coders, CDI specialists, and physicians. One specific example of using criteria is postoperative ileus. Currently, when this term is charted, it may be coded as a complication based on indexing found in official coding references. This can be a problem because some charting takes place soon after certain procedures when slow return of bowel function is expected and integral. Evans notes this can lead to false reporting of ileus with subsequent improper payments as well as skewed outcomes for certain providers. • Prolonged postoperative ileus: patient with an ileus managed with a nasogastric tube and/or the patient is NPO for ≥ postoperative day 3. • Postoperative ileus: Although ileus has numerous causes, the postoperative state is the most common setting for the development of ileus. Indeed, ileus is an expected consequence of abdominal surgery. Physiologic ileus spontaneously resolves within two to three days after sigmoid motility returns to normal. Ileus that persists for more than three days following surgery is termed postoperative adynamic ileus or paralytic ileus. Both AHIMA (Ethical Standards for Clinical Documentation Improvement Professionals) and the Association of Clinical Documentation Improvement Specialists (Code of Ethics) have published guidelines for ethical documentation. The pressure that coders and clinical documentation improvement specialists are feeling doesn’t just come from providers. According to Paul Evans, RHIA, CCS, CCS-P, CCDS, regional clinical documentation manager for Sutter West Bay, what’s even more disturbing is the expectation that every diagnosis will be questioned, even when the documentation is unambiguous. For example, the July 2011 issue of Medicare Quarterly Provider Compliance Newsletter: Guidance to Address Billing Errors highlighted a case in which, upon auditor and physician review, it was determined that the clinical evidence did not support a diagnosis of respiratory failure “despite physician documentation of the condition.” The principal diagnosis subsequently was changed and, as a result, the auditor determined an overpayment had been made. 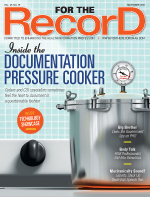 Recovery audit contractors (RACs) essentially are “saying a diagnosis code should have been questioned because the coder should have known the physician was wrong,” Evans says.